» Ready for a roadside nap? Ready for a roadside nap? 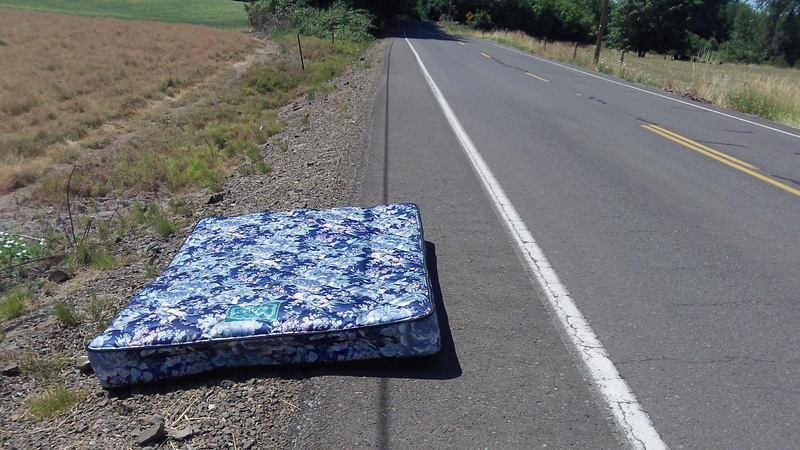 Well, maybe not on a mattress that somebody dumped on the shoulder of the tarmac. OK, when I say it was dumped there, on Bryant Drive outside of Albany, I’m speculating or guessing. Maybe somebody needed to get rid of it and the landfill wasn’t open. Or he didn’t want to drive all the way to Coffin Butte and pay the fee. Or maybe, the family was moving to a new place and the mattress blew off the top of the truck. But if that’s what happened, surely they would have noticed the thing missing and gone back to look for it. It’s sad, but some people among us use country roads and other public property to leave their refuse, especially those bulky items they can’t cram into a trash can. An extra suitcase and a broom you no longer use or need? 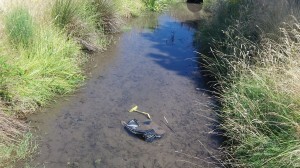 Just throw them in the nearest ditch, or in this case the Eighth Avenue Canal near Swanson Park. To deal with creek dumping, the cities and counties might consider offering volunteers a chance to adopt segments of our waterways — similar to the way some roads are already looked after by community-spirited people or groups. The creek volunteers would periodically take a look and, if necessary, wade in and haul out the odd tire, shopping cart or household tool. The question then becomes where to put the junk. Maybe cities and counties could prevail upon their trash-disposal franchise holders to place large bins at strategic spots. If that was done, a guy with time on his hands who doesn’t want to see a mattress defacing his bike route might ride home, get his truck and haul the thing away. This issue of what to do with large trash items has been a thorn in my side since moving to Albany from So. California five years ago. If, for example, the city would support a quarterly “large Item” trash pickup, property values citywide might be enhanced instead of the opposite, due to the frequency of seeing front yards used as trash bins, or in this case, the side of the road. Not many have the incentive to transport to Coffin Butte when it’s so easy, and cheap, to dump on a roadside.